We've had a happy and productive week here with only a few of the usual bumps along the way. Amber's heart had some crazy episodes this week. I am loathe to say it, but at this point unless it's debilitating we just note it, adjust school accordingly, and go on with life. Amber has been working in the evenings on some creative writing stories over iMessage with her friend. 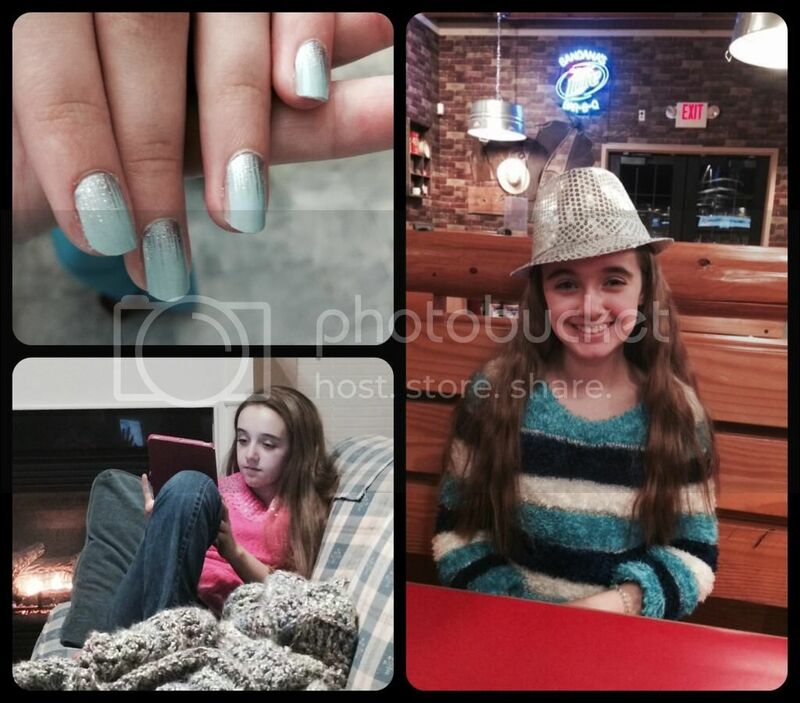 This has been a very positive experience for her and possibly the major contributor to her happier mood this week. It combines two things Amber craves - creative outlets and talking with her friend. I've not read any of the stories because Amber wants to be creative and not worry about perfecting them to a level she feels acceptable to show others. While I always enjoy her inventiveness and quirky personality that comes through in her stories, I understand what she is saying. So for now, I will not read any of the stories and just let Amber tell me about them in her own way. Of course, Amber now is leaning towards becoming a fiction writer as opposed to the meteorologist. She has so many interests and as soon as she gets deep into one topic it becomes her focus for the future until another topic peaks her interest more. I continue to tell her to keep an open mind as her choices swing wildly from science, to languages, to music and other creative endeavors. Someday her preference will be clearer, but we will always provide her the most complete education possible. It snowed here again, in March. Amber felt well enough to play for about an hour, but that also triggered a crazy heart episode. She also worked on her Doodle Crate project from February with Fred. She drew and carved her own rubber stamps. We also finished the Astronomy book work this week and plan to move into Geology next week, assuming there is time for science. We have a few fun projects from a kit we own that may happen as there is time, but nothing is set in stone. When we switched curriculum in December, Amber picked the science topics she wanted to complete for the rest of the year. After working with the astronomy book she found it a little boring, but doesn't think the curriculum is the problem. She said after rarely covering astronomy in parochial school, we might have covered it too frequently at home. It was her favorite science topic, but now it has become uninteresting as there is little left to learn at her level. Lesson learned. She needs more variety in her topics, even if she thinks something is her favorite. She's eager to learn and wants to know more about topics she hasn't covered as often. Hopefully geology will be a success followed by a chemistry unit. In history we started and finished the Black Plague in two days. While there are many aspects one could study about the plague, there is also something quite simple about it too. We then moved on to the Hundred Years War and War of the Roses of which we did not come any where near completing. Still there was the momentous event of completing all the supplemental work we scheduled from Homeschool in the Woods' Project Passport: The Middle Ages. Yay! Never fear, we are moving on to Project Passport: Renaissance & Reformation to supplement the rest of the year. This means we are approaching my favorite era of history to study. I'm trying to keep my enthusiasm at a minimum and hold back the plethora of details for when Amber covers this again in high school. But it's soooo hard. Little known fact: While Fred was in graduate school I worked for the same university where we had already graduated. The benefits plan allowed full time employees to take a couple of classes a semester, if they liked. However, knowing I would leave when Fred was finished which wasn't enough time for me to slowly finish a master's program, I chose to go in an entirely different direction than my already degreed science & math related fields. In the end, my employment there left me three classes (9 hours) short of another bachelor's degree in History, specifically English History. Poor Amber. She has no clue what's in store for her. Quite possibly the prettiest representation of the Black Death ever seen and finishing the Middle Ages timeline. 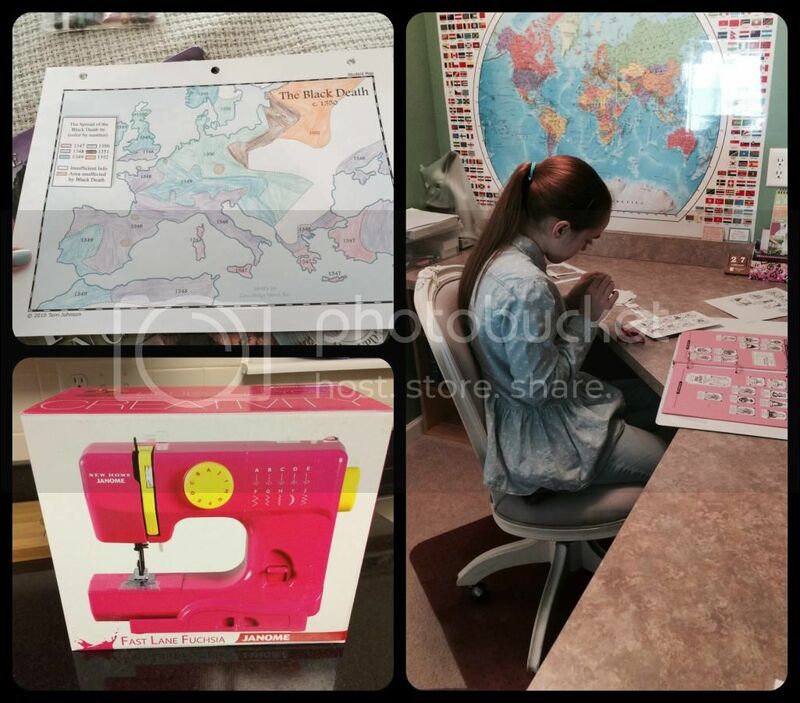 Amber's new gadget: her very own pink sewing machine. She has the desire to try her hand at sewing. Who am I to hold her back? Besides school we've been participating in another online Facebook Jamberry party hosted by my sister this time. These things are so addicting. I know the nail wraps are supposed to last up to two weeks per application, but I can't keep my nails the same pattern for that long. Besides, I have a stack of wraps waiting for me to use. Amber also spent many late afternoon & evening hours this week on a new online curriculum / game / website that we are reviewing for the Review Crew. I can't wait to tell you all about it next month. Amber is over the moon with this product and I'm pleased with what it provides. Seriously, it is addicting in a good way. We spent a goodly amount of time this week finishing Amber's confirmation homework for the most recent class session and hope to turn it in this Sunday a little ahead of the deadline. Earlier today we made the trek to Mercy Hospital, where Amber's pediatric specialists are located, so she could donate all the knitted hats she created for her service project. Of course, I didn't take any pictures but we did get the service hours log signed. Amber's first complete set of Jamberry wraps and the outfit she planned to go with her wraps. And.. texting and texting a creative story with a friend. This weekend brings the much anticipated event: the live performance of Phantom of the Opera at the Fox Theater. We purchased tickets many months ago, including one for my mom as part of her Christmas gift. Amber is beyond excited to finally see it in person instead of watching video performances. I doubt Amber will function much the day after the performance, but what is that in comparison to seeing Phantom of the Opera live and in person? With Philip we used to call it our new normal and yes it is ok to feel a little guilty about it. Amber may be interested in a writing podcast called Writing Excuses. They are 15 minutes long and there are four writers that talk about a given creative writing topic. The one that she would be most likely to know of the group is Brandon Sanderson. Wow! I love Phantom of the Opera. I hope you all have a wonderful time. Another great week under your belt. We began feeling that way about Bethany's seizures. We can't stop them and we can't let them put everyone's lives on hold. You do what you gotta do to survive! I know Amber is going to LOVE seeing the Phantom live! Have you seen Wattpad? It's a creative writing community where young writers can share their stories with others, even design covers for their books! Cati loves it and spends a lot of time writing and sharing...I bet she's having some fun with that pink sewing machine! !